"Each meal, be it for a table of 2 or a tent-full, an intimate history or a mission statement, is a story of its own. I co-author these stories, interpreting your vision through bespoke menus, creating singular moments WITH plotlines that you can literally "sink your teeth into", that come to life in memories that stick with you".whether yours is a family gathering, friends sharing a milestone birthday or a team-building event,How can I help you tell your story? Vision video for the Museumpark. The team came to Silicon Valley to fundraise, presenting to Dutch philanthropists and innovators. Our challenge was to interpret the museum's six core principles through food. Turning the concept of a museum on it's head, the Museumpark will be the world's first uncurated art collection. Instead of seeing just 15% of the art the museum owns (this is typical of any museum), all the art will be on display and visitors will "curate" their own way through the collection. (See video above, minute 3:00). We turned dinner on its head, serving a savory "dessert" as the first course. The “red” and “golden” liquid is presented as a palette, guests are encouraged to create an “intimate conversation in a plate” as they mix the ingredients; just as the Museumpark will allow visitors a unique intimacy with art. 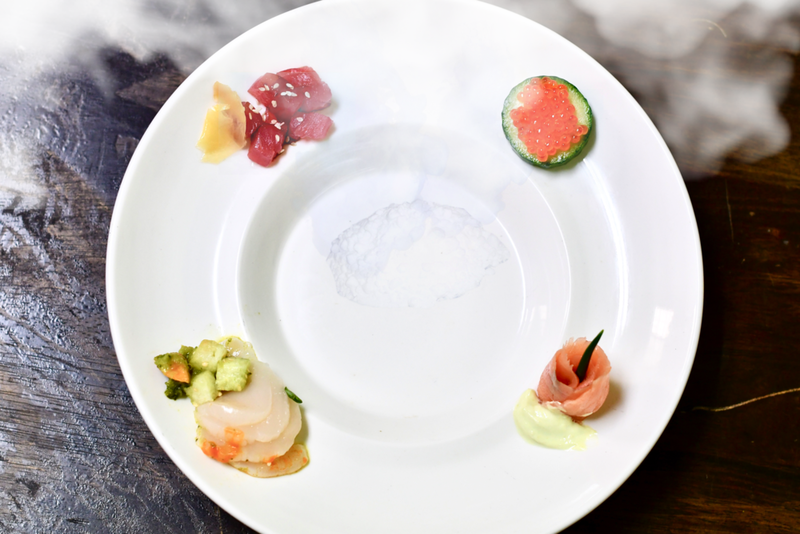 An innovative presentation in a "fog on a plate", in a nod to the museum's innovative approach to sharing art. Just as museum visitors will be able to choose what art to view (as opposed to having a curator choose for them). We asked gelatin artist Rosa Rodriguez to create one of her artisanal Gelatina Artistica desserts to interpret the museum's focus on transparency-- the way each visitor can "see into" the entire process of putting a museum together. Gelatina Artistica is an edible art form that came to Mexico via France, during Napoleon's occupation of that country, and where the Mexican's perfected it. All ingredients are 100% edible.